I am developing something to put later in production, and I'm starting to get real data (ie: not test data) from my google spreadsheets. The google spreadsheet has a "description" column which contains a sort of "description text" for ech row item, formatted there as "Automatic". my Teiid model "gssmodel" retrieves a DDL with the column as "string" type (4000 chars limit in Teiid) ("NATIVE_TYPE 'STRING')"
But somehow, although the model DDL defines the column as "string", Squirrel can get all field content, as if it was a clob... perhaps. Yes. That is a not too well documented feature of the value system - anything we create is expected to conform, but the translators are open to return whatever values they want. The expectation, at least for typical JDBC imports, is that the source column length will be set on the source model appropriately. However in the case of a native call, we're just using the default metadata. If the arraytable and the view are both clob, you will have the whole cell text available to you correct? convert(array_get(w.tuple, 7), blob) - should fail if the value is not a binary type already. So you would need to use to_bytes, then to_chars - but this shouldn't be necessary as using the clob type directly should accomplish the same thing. Can you clarify what is your desired behavior - do you want the length enforced, or do you want the full content? Sorry that sentence wasn't clear enough. Using just the clob type, you would expect to see the whole thing. It looks like the issue is that the implicit array_get operation is truncating the string - but it should not be. That will require an issue to fix. I just omitted other fields, and replaced table/view names to something more understandable. 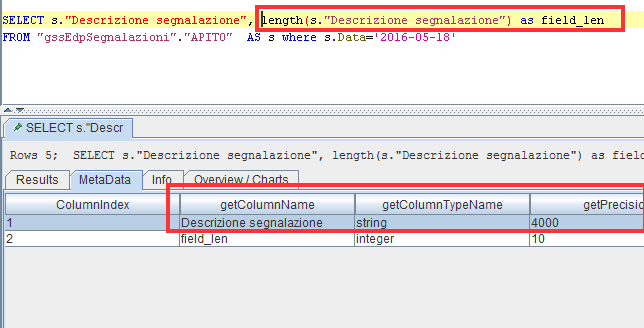 Error: TEIID30070 Remote org.teiid.api.exception.query.QueryResolverException: TEIID30070 The function 'length(s."Descrizione segnalazione")' is a valid function form, but the arguments do not match a known type signature and cannot be converted using implicit type conversions. so I can't obtain a result to get the length of that field's values in the view, but believe me, copied the cell content in a text editor and counted, it's 4000. There are a lot of string functions that currently only operate on the string type - [TEIID-1248] Clob usability - JBoss Issue Tracker covers expanding our logic, but the length function has not been specifically called out yet. 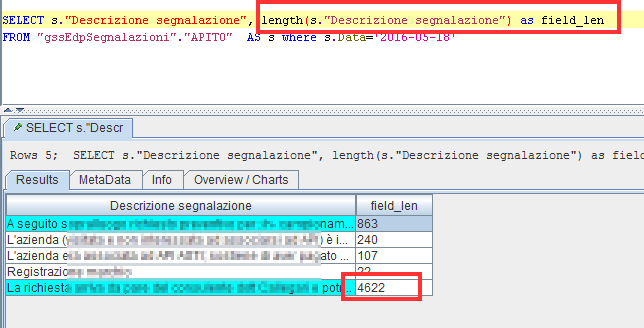 > so I can't obtain a result to get the length of that field's values in the view, but believe me, copied the cell content in a text editor and counted, it's 4000.
this will surely help us to make users of google spreadsheets more confident that their data can be integrated well within applications.